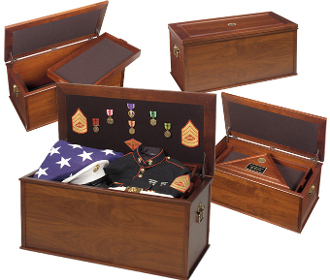 The Heirloom Personal Effects Chest was originally commissioned to honor the memory of those soldiers who have fallen while serving to protect this nation. The Heirloom Personal Effects Chest was originally commissioned to honor the memory of those soldiers who have fallen while serving to protect this nation. Store your memorabilia, personal possessions and/or flag case in this Heirloom Walnut Chest built to the finest traditions of the military. Embedded military specific medallion mounted in the top lid (Army, Air Force, marines, Navy, Coast Guard or Great Seal of the U.S.). Lid has Velcro-friendly fabric to attach medals or photos. Flush mounted key lock.